Whether you have a need for speed, a genuine love for the region’s water wonders or simply an occasion that needs to be celebrated, The Yellow Boats deliver in style. Pickup: Dubai Marina Walk – Opposite Spinneys - Dubai. This tour shows you everything! Start your trip around the stunning vista of Dubai Marina and then into open water where you will cruise around the amazing Palm Jumeirah, home to the Atlantis Hotel, where you will pause for the perfect photo opportunity. From there it’s on to the world famous Burj Al Arab 7 Star hotel, a true Dubai icon. 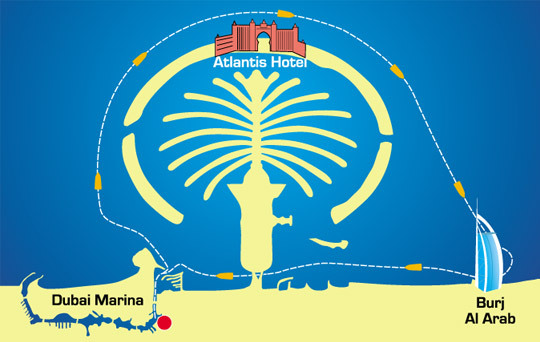 Our tour then heads back along the coast with the spectacles of the Royal Palaces, Palm Lagoon and on to the Marina. There is plenty to see on this trip, so get your cameras ready! Pregnant women and very elderly people are also not recommended. Cancellation more than 7 calendar days No cancellation fee. Cancellation within 3 calendar days 100% cancellation fee (no refund). Cancellation the day of the services or after 100% cancellation fee (no refund). Bookings can be made online through our website or you can contact our tour consultants on the above number. Online Payment options are also available by making direct payments with your Visa / Master Cards.